A pair of supermassive black holes has been found in a spiral galaxy (like the Milky Way) for the first time. This galaxy, called NGC 3393, is relatively nearby at a distance of about 160 million light years. These two black holes may be the byproduct of a merger between two galaxies of different sizes a billion or more years ago. Evidence for a pair of supermassive black holes in a spiral galaxy has been found in data from NASA's Chandra X-ray Observatory. This main image is a composite of X-rays from Chandra (blue) and optical data from the Hubble Space Telescope (gold) of the spiral galaxy NGC 3393. Meanwhile, the inset box shows the central region of NGC 3993 as observed just by Chandra. The diffuse blue emission in the large image is from hot gas near the center of NGC 3393 and shows low energy X-rays. The inset shows only high energy X-rays, including emission from iron. 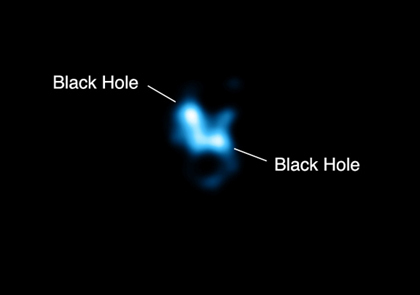 This type of emission is a characteristic feature of growing black holes that are heavily obscured by dust and gas. Two separate peaks of X-ray emission (roughly at 11 o'clock and 4 o'clock) can clearly be seen in the inset box. 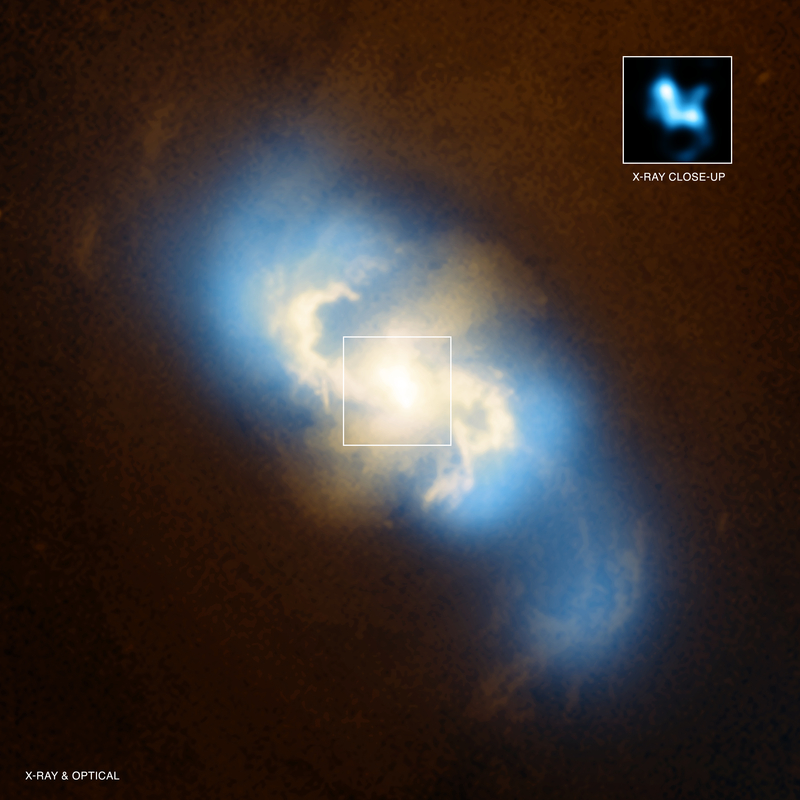 These two sources are black holes that are actively growing, generating X-ray emission as gas falls towards the black holes and becomes hotter. The obscured regions around both black holes block the copious amounts of optical and ultraviolet light produced by infalling material. At a distance of 160 million light years, NGC 3393 contains the nearest known pair of supermassive black holes. It is also the first time a pair of black holes has been found in a spiral galaxy like our Milky Way. 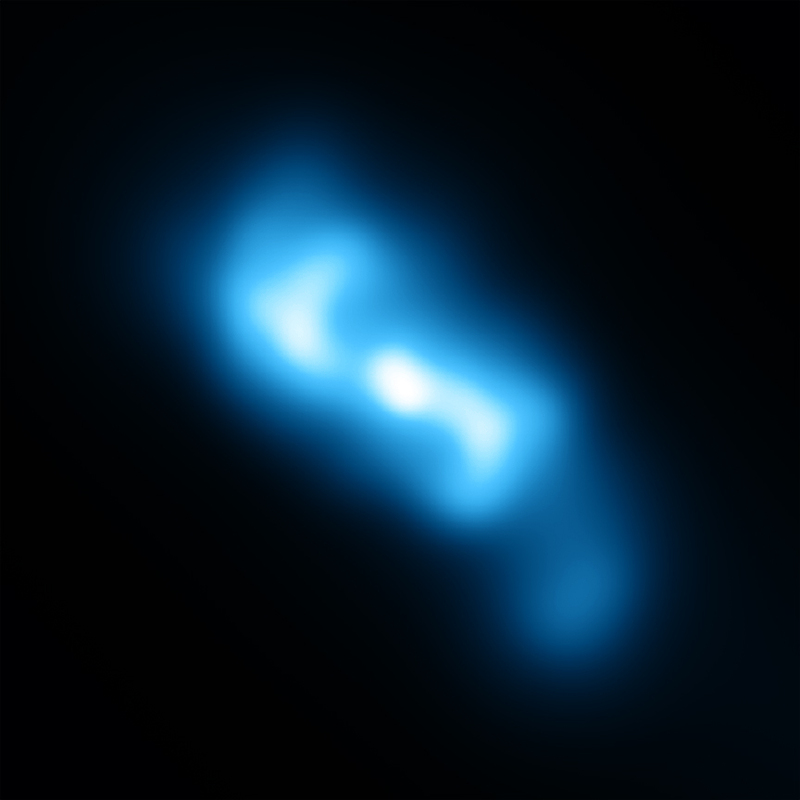 Separated by only 490 light years, the black holes in NGC 3393 are likely the remnant of a merger of two galaxies of unequal mass a billion or more years ago. Dubbed "minor mergers" by scientists, such collisions of one larger and another smaller galaxy may, in fact, be the most common way for black hole pairs to form. Until the latest Chandra observations of NGC 3393, however, it has has been difficult to find good candidates for minor mergers because the merged galaxy is expected to look like an ordinary spiral galaxy. If this was a minor merger, the black hole in the smaller galaxy should have had a smaller mass than the other black hole before their host galaxies started to collide. Good estimates of the masses of both black holes are not yet available to test this idea, although the observations do show that both black holes are more massive than about a million Suns. Coordinates (J2000) RA 10h 48m 23.40s | Dec -25° 09´ 43.00"
I agree that including the links to the original research paper would be a great add-on to this website. It is a awesome shot, you develop an excellent work. Thank you for sharing these images with us. The best of luck for you. Well done, an excellent discovery. Yes, is there a publication associated with this? Pretty amazing stuff. Very good pick up by astronomers concerned. Do the two holes merge over time, I wonder? Can they continue to exist side by side? Suggestion: include the link to the original research paper in the press release. Amazing, keep up the good work. Best of luck. A pair of supermassive black holes in a spiral galaxy located about 160 million light years from Earth. About 160 million light years from Earth. About 9,800 light years across. X-rays are blue and the optical data is gold. In the constellation Hydra in Northern Hemisphere & Southern Hemisphere.